Plastic Surgeon Dr. Marc Mani took time from his busy practice to talk with Shedding Light about his practice, advanced technology in cosmetic surgery, and why his Enova LED surgical headlights are beneficial to successfully performing surgery. Shedding Light: Tell us about your background and your practice? Dr. Mani: I earned my undergraduate degree from Harvard University and received my medical school and residency training in the plastic surgery program at Baylor College of Medicine in the Texas Medical Center. I’ve been practicing cosmetic and aesthetic surgery for 13 years and have two offices, one in Beverly Hills and one in Dubai. All surgery is performed in my own fully-accredited Surgery Centers and my focus is facial rejuvenation including facelifts, eyelifts, brow lifts, forehead lifts, facial resurfacing, BOTOX® cosmetic, and rhinoplasty. In addition, I perform tummy tucks, breast lifts and enlargements, endoscopic surgery, and liposuction. Both locations have skin care spas, where patients enjoy laser and spa treatments. I work with a wide range of patients including many high profile entertainers who appreciate my confidentiality. In addition my practice, I often speak at American Society for Aesthetic Plastic Surgery (ASAPS) and International Society of Aesthetic Plastic Surgery (ISAPS) meetings. Dr. Mani: When I started out, I heavily promoted the practice. Lots of media as well as a reality television show. All of that hard work has paid off. Today my practice is referral based, which is more predictable and reliable. Dr. Mani: For the past three years I’ve been performing facelifts with Harmonic technology. This relatively new technology uses ultrasound to separate tissues, which result in dramatically less swelling, less bruising, and a quicker recovery. Johnson and Johnson is the maker of Harmonic technology and I’ve been fortunate to help them in developing the product and in training other plastic surgeons in how to use it. Dr. Mani: Lighting is critical during surgery; it is perhaps the most important of an OR repertoire. The quality and color of the light is essential. During surgery I must distinguish between nerves and tissue and be very exact. I don’t have the luxury to make mistakes and the Enova headlights provide a true picture. Shedding Light: What Enova LED surgical headlights do you use and when did you first hear about Enova? Dr. Mani: I first heard about Enova headlights years ago; perhaps in 2007. A fellow plastic surgeon told me about them. I purchased two Iris S-100 headlights and keep one in each office. 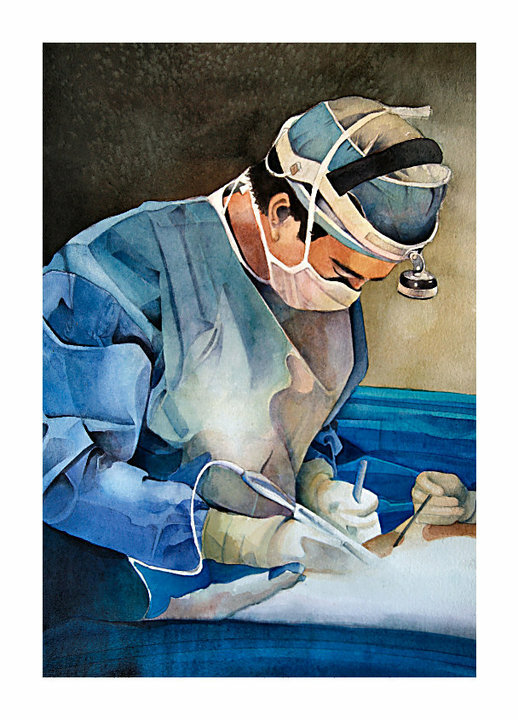 Dr. Mani: I use my S-100 during every surgery I perform. I am in the operating room three days a week. I like the battery life of the battery pack; it is extremely long lasting. I also like being cord-free, especially for performing breast surgery. Dr. Mani: Yes, many times. I’m pretty particular and my colleagues know that.